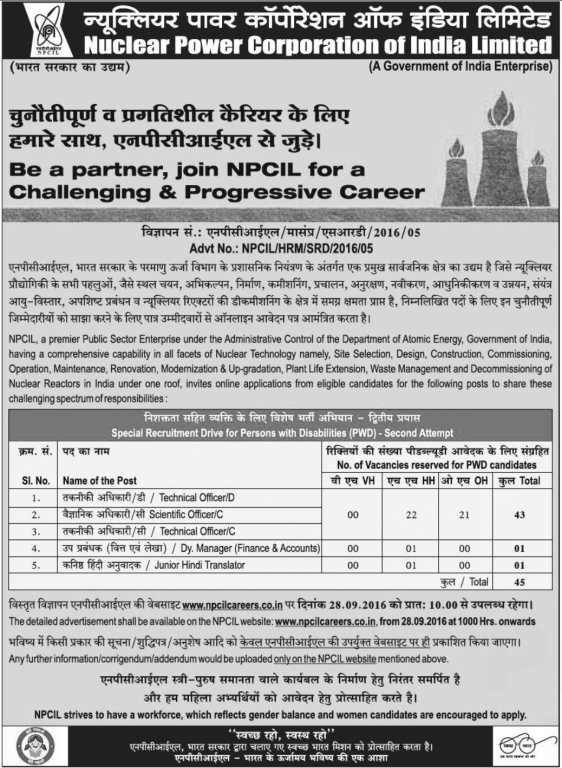 Nuclear Power Corporation of India Limited i.e NPCIL invites online applications for (PWD Category Only) 45 vacancies of Technical Officer, Scientific Officer, Deputy Manager and Junior Hindi Translator. NPCIL strives to have a workforce, which reflects gender balance and women (Female) candidates are encouraged to apply. The Online applications start from 28th September 2016. The Nuclear Power Corporation of India Limited is a government-owned corporation of India based in Mumbai in the state of Maharashtra. For details available from 28th September 2016 at 10:00 Hours onward. 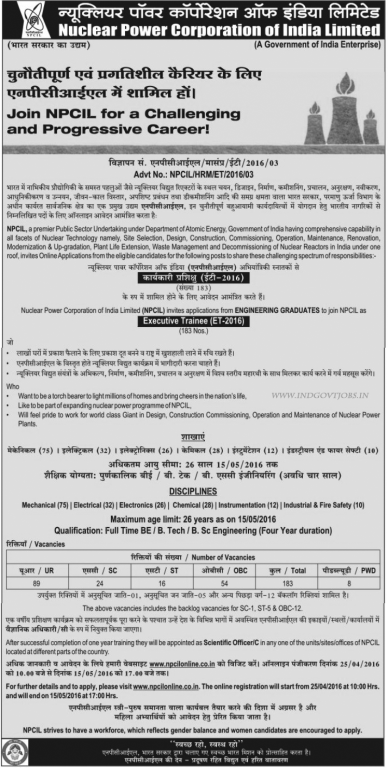 Nuclear Power Corporation of India limited i.e NPCIL, A Government of India Enterprise invites Online Applications from Engineering Graduates to join NPCIL as Executive Trainee (ET-2016) for 183 Vacancies. The online registration will start from 25th April 2016 and end on 15th May 2016. Full Time B.E. / B.Tech / B/Sc. Engineering Discipline (Four Year Duration). Maximum General - 26 Years, OBC - 29 Years, SC / ST - 31 Years as on 15th May 2016. Online Test and Interview. Shortlisted candidates will be called for Online Test on Engineering Disciplines. The Test will be tentatively conducted from 14th June, 2016 to 20th June, 2016 for all the disciplines. Applicants shortlisted through Online Test will be interviewed at NPCIL, HQ, Mumbai. Tentatively interviews will be held in July, 2016. 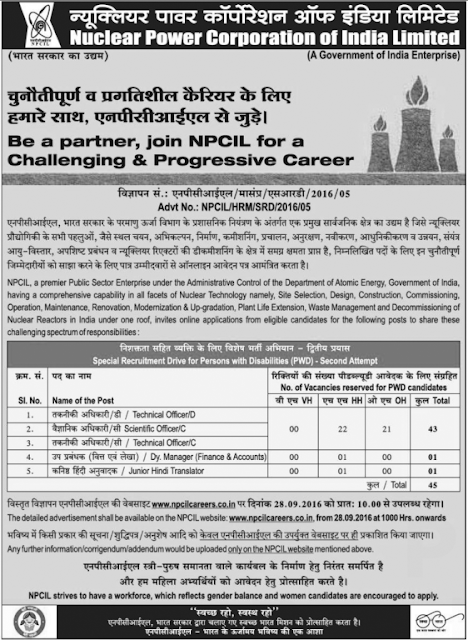 Names of short-listed applicants through Online Test will be declared in the NPCIL Recruitment Website.